My project WATU has been selected by the European Research Council in the Consolidator Grant Call 2014. It started in october 2015 and it was awarded about 2 M€. 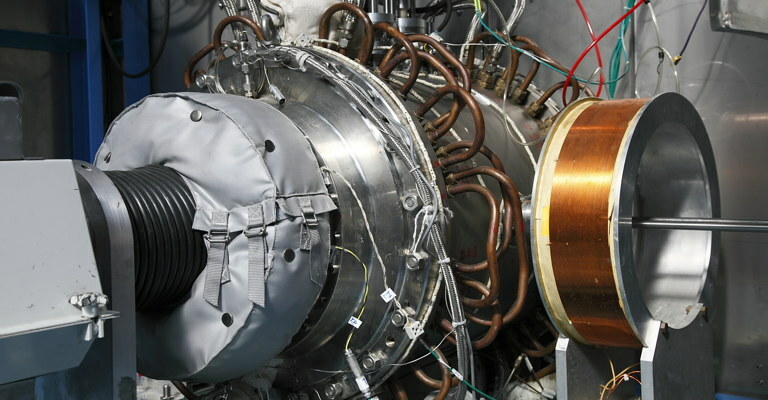 The goal of the project is to provide a strong advance in the experimental studies of wave turbulence. Indeed wave turbulence (as opposed to fluid turbulence) is characterized by many theoretical developments (in the wake of the Weak Turbulence Theory – WTT) but a relative lack of experimental data. The theory exists thanks to the possibility to observe weakly non linear waves and thus to perform an asymptotic development that leads to a statistical theory. The question is then whether such a weak turbulence can exist in real systems with finite size, finite wave amplitude and dissipation. 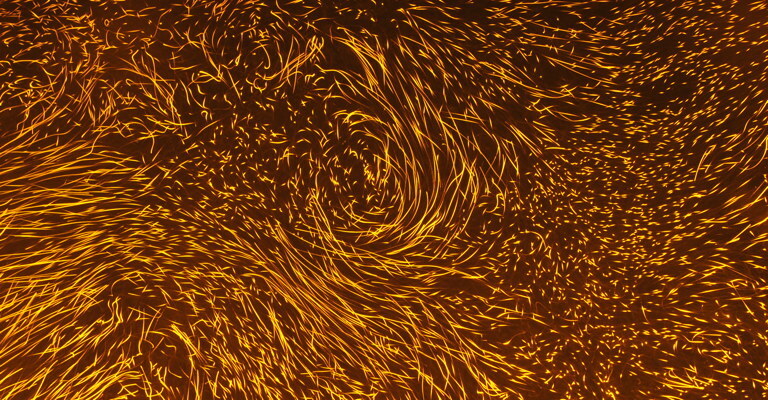 Wave turbulence can be observed in many dispersive wave systems such as solar winds (Alfven waves in the magnetized interstellar plasma), magnetized industrial plasmas (such as ITER), in non linear optics in fibers or non linear crystals, vibrated elastic plates or oceanic waves. For example, it plays a major role in the ocean dynamics. Indeed, the oceans are stratified in density due to variation in temperature and salinity. Thus they support the propagation of 3D internal waves supported by gravity. The rotation of the Earth plays also a role so that the waves dynamics is actually also influenced by the Coriolis force (inertia-gravity waves). 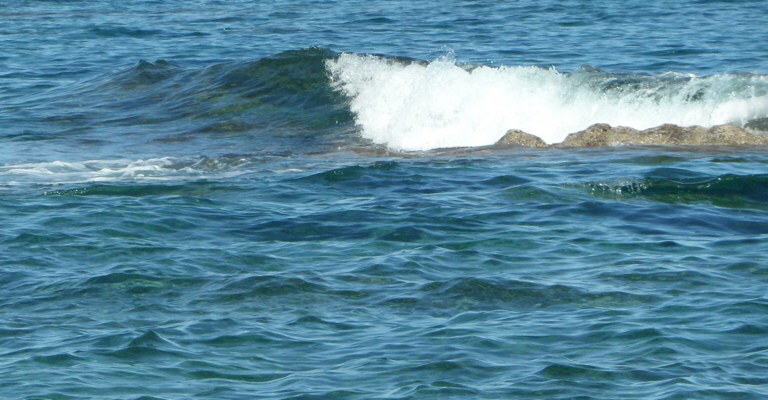 These waves play a role in mixing of the density profile, in redistributing energy in the ocean (in terms of position but also of length scale) and also in dissipating the energy as an ultimate fate of the turbulent energy cascade. These feature have to be accurately parameterized in numerical simulations of long term ocean dynamics for weather forecast or climate predictions. This parameterization implies an accurate understanding of wave turbulence that is presently quite limited. 1. Is it (always) possible to observe weak turbulence in real systems ? 2. Beyond the Kolmogorov-Zakharov spectrum ? 3. What if turbulence is not weak ? 4. What about non dispersive waves ? 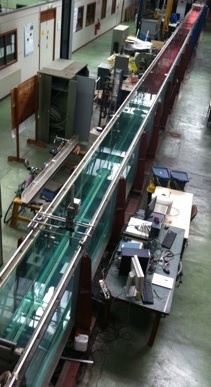 View of the 30m 1D wave flume in its former configuration dedicated to the study of beach formation and sediment transport. View of the renovated Coriolis facility that just went back into operation. It is a 13m diameter turntable that can rotate up to 6 rpm. It can carry over 100 tons of water with custom salinity profiles. 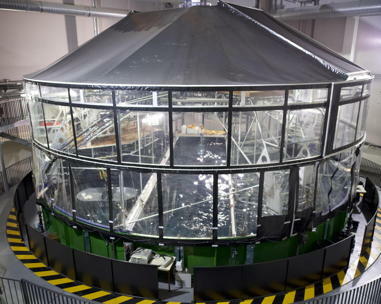 It is a unique facility dedicated to geophysical oriented experiments aimed at reproducing the ocean dynamics.